In March, A&W Canada announced that within two years, the fast-food chain plans to only serve eggs from hens raised cage-free and that it was committed to investigating best practices for cage-free eggs. Days later, a group of large Canadian grocers, including Loblaw Companies Limited, Metro Inc., Sobeys Inc. and Wal-Mart Canada Corp., also announced they were voluntarily moving to cage-free eggs by the end of 2025, depending on supply. These announcements underscore a new chicken-egg conundrum: cage-free eggs appeal to consumers’ demands for more natural foods from healthy and humane sources like happy hens who aren’t stressed by their living conditions. But a leading animal welfare scientist at the University of Guelph says what’s best for hens and Canada’s supply of healthy eggs isn’t quite as simple as farmers opening up the cage doors. Professor Tina Widowski is director of the university’s Campbell Centre for the Study of Animal Welfare. In 2011, she was appointed Egg Farmers of Canada Poultry Welfare Research Chair. She researches laying hens and is helping create the standards for farm animal care in Canada with the National Farm Animal Care Council. What does a hen want? Besides the basics of shelter, food and water, Widowski says the needs of a hen involve four high priority behaviours: nesting, perching, dust bathing and foraging. In a conventional cage, a chicken lacks an enclosed space to lay eggs, has nowhere to perch, nowhere to scratch and food is delivered to them. “If any animal really wants something they will work to get it,” Widowski says. Observing this determination, and also signs of frustration in hens when something isn’t available, helps researchers like Widowski know what’s important to a hen. Current conventional housing for laying hens are battery cages, which were adopted because they increase efficiency for feeding, manure management and egg collection. These cages are regulated to a minimum 432-square-centimetres of cage floor space per bird. The biggest downside of battery cages for the feathered occupants isn’t space, but instinct, Widowski says. In enriched cages, hens can express many of those vital instincts because they have access to nesting boxes, scratch pads and perches, as well as more space. Widowski believes that high welfare for hens can be achieved in enriched-cage housing. “When you stick your head in where the birds are in the enriched cages, you can see they’ve got space and they are busy nesting, scratching and perching,” she says. It’s the quality of the space that’s important, she says. “Cage-free doesn’t necessarily mean giving hens what we know they need. Cage-free is just taking them out of a cage,” says Widowski. For example, not all free-run housing has sufficient perches or litter management systems. “When a company says, ‘we are going cage-free,’ they are not actually stipulating the standards for that cage-free environment,” she explains. Widowski considers the evolution toward new housing environments for laying hens a positive change, but she wants to prioritize the way housing is managed over the terminology used. For consumers, it becomes a matter of terminology and wording, says Mike Von Massow, a professor at the University of Guelph who studies consumer behaviour, especially pertaining to food. The word “cage” creates a strong, emotional reaction in consumers, he says. And it also causes confusion. 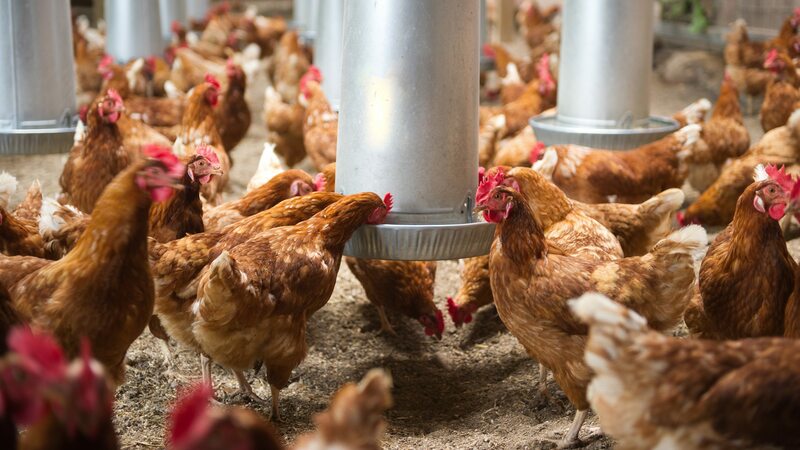 Egg Farmers of Canada recently announced they are “moving away from conventional housing,” which means farmers are phasing out traditional battery cages over a 20-year period (50 per cent is projected to be complete in eight years). But enriched or furnished cages are still on the table, along with other housing options like aviaries. Three years ago, Jacob Pelissero and his family chose to switch their 17,000-bird farm to enriched colony housing from conventional cages. The barn is divided into pens with furnishings like nest boxes, perch rails and scratch pads. The Pelisseros have always considered themselves innovators, and as the next generation of the family plays a bigger role in the farm, the timing was a good fit. Despite research showing positives for hens in enriched housing, Von Massow says consumers will likely continue to ask for “cage-free” options, like aviaries where birds are free to move between wire floors or single-tier barns with an open floor plan. For Widowski, an ideal egg industry is one where a variety of different housing styles are used, and farms use the one best suited to their managing abilities while optimizing hen welfare. “Having a mix of enriched and cage-free systems is probably best for Canada as a whole — for hens, farmers and consumers.” That’s why Widowski and her fellow animal scientists continue to research how to optimize hen welfare in each of these different environments, including selecting the right breeds, raising young birds and determining the best furnishings. An enclosed wire cage kept inside a barn, with each cage usually housing between four and eight hens. These cages are required to be certain sizes depending on the size of the hen, and the number of hens they house. Both manure and eggs are separated from the hens (and each other!) for easy management, food safety and bird health. More space is required per hen for housing to be considered enriched, but it also involves furnishings that allow hens to satisfy instinctual behaviours: nesting boxes, perch rails and scratch pads. Hens are usually divided into groups to manage aggressive behaviours. To be considered free-run, a barn must have 1,900 square centimetres for each hen, but requirements are different depending on the kind of flooring in the barn. A type of free-run housing with slatted floors, nests and often litter areas and furnishings. Another type of free-run housing, with different levels, furnishings and where the birds are free to move between levels and the floor. Free-range means that hens have access to the outdoors. The Codes of Practice require fencing to protect hens from predator animals.